I'm realizing that, after doing the conversion from .wav to .pcm with wav2msu, it adds a click in the beginning of the track. I mean, the .wav begins sounding clean, but after the conversion to .pcm it sounds with a click, Why this happens?. It's good practice to leave around 1/16th (or 1/32, at least) of a second silence at the beginning of each track to eliminate that click. Clicking usually means that the waveforms' position around the zero crossover point is either above or below, or doesn't match the position of the incoming wave at that point. It should start at the zero point (in the middle). Looping is the same principle, make sure your loop points start and end at the zero crossover to avoid clicking. Relikk wrote: It's good practice to leave around 1/16th (or 1/32, at least) of a second silence at the beginning of each track to eliminate that click. 3,75 miliseconds of silence then?. The thing is that all my tracks have some silence at the beginning of every track. @Conn i uploaded my two packs, but theese need to be checked. 1500 samples of silence is usually what I put in at the beginning, but you can experiment. If you think there's adequate silence and it's still clicking, then there could be a spike at the beginning of your waveforms, depending on the source and how they were encoded. If that's the case then depending on how close it is to the beginning, you can fade it in or cut it out, but bearing in mind that the process doesn't make it sound unnatural. Relikk wrote: 1500 samples of silence is usually what I put in at the beginning, but you can experiment. One thing that i've noticed, is that i hear no clicks with any editor until i play the game, or i convert the file again into an .wav file. Anyway, i'm checking all, and between now and this night i hope it can be ready for posting. wav2msu isn't capable of converting to mono, it's strictly 2 channel, 16-bit and 44.1kHz, so I don't know what's going on there. @Conn GoogleDocs Track map information has been updated to reflect the additional track 32 added by your most recent patch. Also updated the movie OST to include the no 3.5 sec delay for Corridors of Fury 161 (named alien3_msu1-32.pcm), per your request. It is currently being uploaded. May be done soon, it is uploaded. As always, my PCM links remain the same unless otherwise noted. Yes, i have made two packs, the one you know, and a second one with an extra filter of stereoize. These two have clicks in all the tracks except -2 and -32 (but i'm on it to fix the rest). Señor Ventura wrote: These two have clicks in all the tracks except -2 and -32 (but i'm on it to fix the rest). I converted one of the PCM's back to WAV and found what you were mentioning. There's a spike at the beginning causing the clicks. I cut that off and converted it back to PCM using WAV2MSU and I didn't get that spike. I'd say re-download a fresh copy of WAV2MSU. The results you're getting shouldn't be happening. Yes, i will clean all the tracks. Tomorrow i have not to go to work, so finally i could sit on my chair to fix both pcm packs. ...and continue with all that i've been working on (ninja gaiden 2, batman returns, final fight 2 & 3). I noticed of that. My .wav tracks are clean, but after convert to .pcm with the wav2msu is when those clicks appeared. Señor Ventura wrote: I noticed of that. My .wav tracks are clean, but after convert to .pcm with the wav2msu is when those clicks appeared. Have you tried another downloaded and fresh copy of wav2msu? Especially the one that Relikk put a link from earlier? Note: I already downloaded the new wav2msu before start again. All my attempts results in a click in the beginning of every track (the .wav is clean, but when it is converted to .pcm, it has attached that clicky noise). But some tracks, like the track 2, sounds within the game without any click. That track 2 was forced to keep a loop, but then there happens some curious thing... if i rename it to -0, it sounds in the very first intro with a click, but if i rename again to its original name (-2), then it sounds perfectly clean. I'm varying the duration of silence at the beginning of each track, and still the same with the result. Ok, i will write down in a paper sheet what methods i'm using to not repeat these uselessly. P.D: I noticed that, reproducing my clean .wav tracks with a media player, the music that is playing sounds with a click when i close the program directly without stopping it. Could be possible that my hardware is causing in the conversion that clicks like a kind of static noise?. @Señor Ventura Can I use your PCM set to do some tests? I will download them today and see what is going. Maybe you are on to something with your current hardware setup. Did you try to use Audacity instead of Goldwave for your WAV file creation? Nevertheless, I can re-PCM these files for you without the “click” issue so that we can get this release out. 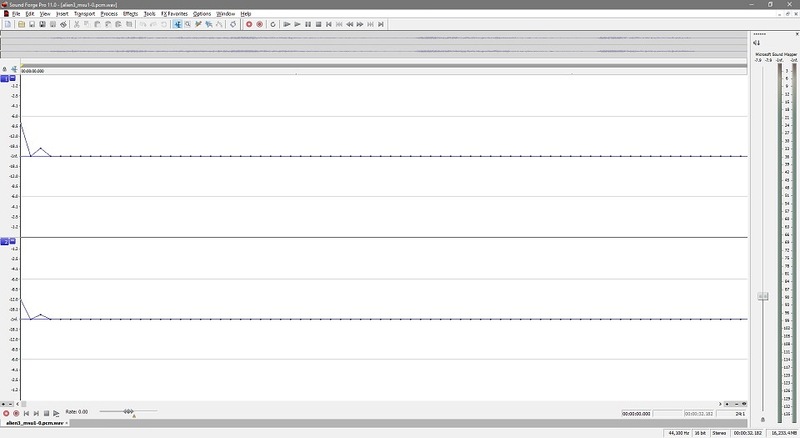 @Conn Forgot to mention that on Higan, there is some buzz clip noise on Intro 1 and 2. The rest of the game is fine. This does not happen on latest bsnes. Have not tried Kurrono’s sd2snes yet or Snes9x. You mean a short buzz blick right before -0 and -1 start? I think this is what SV is talking about. I don't have this issue when plugging in msu tracks from Zelda or Hook or whatever. Can it be something with the pcm you use? @Conn No, this is only when the initial two intro plays for first 2-3 seconds then it goes away. This only happens on Higan though. This does not occur on Bsnes.